Want to get on track with recycling at your business? Various metro areas and counties in and around Portland require businesses to meet certain recycling requirements. But following those requirements isn’t always easy for people who are busy helping customers and running their business. Even the best-intentioned office recycling initiatives sometimes fail. If you want to meet your area’s recycling requirements and do your part to help the environment, this post can help. We’ll look at the main reasons why many recycling plans fail. Then I’ll tell you how to set up a recycling system that will work for your business. What Are Your Recycling Requirements? Each area has its own recycling regulations for businesses. For example, the Portland metro area explains it’s recycling requirements here. And you’ll find Washington County’s similar recycling requirements here. A quick Google search should turn up results for other areas. Here’s a helpful guide showing what to recycle and how. It’s for Portland, but it’s a helpful resource for pretty much any Greater Portland area business. If that sounds a bit overwhelming, don’t worry. Almost every city and county lists a help number on its website, where you can get your questions answered. I’ll also give you a list of more resources to help you at the end of this post. Sometimes, it’s easier and more cost effective to hire a company that offers commercial recycling services to manage your recycling program. For example, at Cascade Building Services, we know all the regulations and can keep everything running efficiently. Contact us to learn more, or keep reading for our tips on how to manage your recycling program on your own. How much is the business currently wasting? How much of that waste do you think you can realistically expect to recycle over the next year (or whatever timeframe makes sense for your business)? Answering those questions will help you figure out what resources you need to make your recycling plan work. If you’re not sure where to start, talk to your janitorial service. They probably have a good sense for your recycling needs already. You’ll also probably need to contract with a recycling hauler in your area to arrange regular pickups. Why is it so hard to get people to recycle? 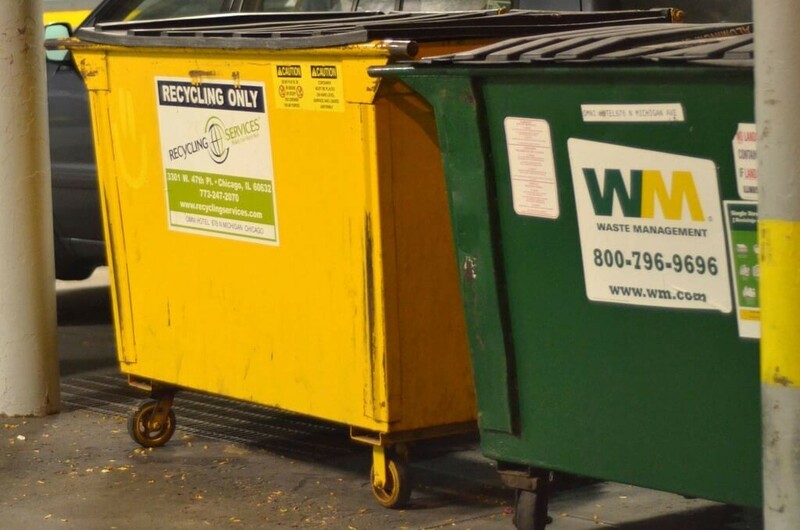 Despite the fact that recycling can reduce your trash bill and help the environment, businesses still send over 100,000 tons of recyclable paper and containers into landfills in an average year. Why is that? That’s why it’s not enough to just convince people that recycling is important. You have to make recycling easy — so easy there’s no reason not to do it. Once recycling is easy, it becomes a habit instead of a chore. The goal is to make it just as easy to recycle as to throw something away. That means making recycling boxes as easily accessible as your garbage cans. Depending on how much paper recycling your company generates, that might mean having a recycling box next to every garbage can. If you work in Portland, you can order free recycling boxes here. When it’s not clear whether something is recyclable or not, many people’s first instinct is to toss it in the trash. Make it easier for your employees by placing posters above recycling receptacles that show what should go in each one and what shouldn’t. If you and other company leaders make a point to recycle, it makes it easier for everyone else to follow your example. That’s why it’s so important for larger companies to get leaders from each department on board to make sure the recycling process is running smoothly in each department. There are some pretty mind-blowing statistics about recycling out there. Hearing them can make recycling fun. It also helps people see exactly where they are making a difference when they throw those papers in the recycling instead of the trash. You could power a computer for three hours with the energy you save from recycling one aluminum can. Recycling aluminum requires 95% less energy than processing new aluminum. Recycling one plastic bottle can save enough energy to light a 60W bulb for up to six hours. Why not put together a list of fun recycling facts and turn it into a company-wide email or even a bathroom poster? You might even call attention to certain recyclable items you know people use a lot. Did you know you can recycle a Starbucks cup, lid and all? Recycle at Work — Find all kinds of tips and resources, and arrange for a specialist to come to your business for free to help you get started. Free printable posters — Portland businesses can print these and place them near recycling receptacles to help employees out (available in Spanish and other languages). How Do I Recycle? Common Recyclables – Not sure how to recycle weird materials like batteries, used oil, or light bulbs? Check out this resource from the EPA. I hope this post helps you encourage more recycling at your business! If you’d like to know more about how we can manage your recycling program, or just have more questions, get in touch! previous post: Is there a problem with your office cleaning service? next post: Do Sustainable Cleaning Products Really Work?